There are plenty of dining options at Shangri-La Hotel Singapore. 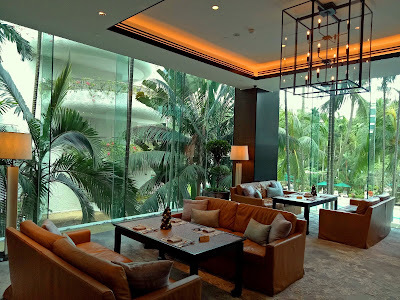 The Lobby Lounge is one of the many restaurants in this 5-star hotel. Located at the Tower Wing's lobby, the eatery is separated from the hotel's reception by an infinity pool with "floating candles". Behind the bar is an imposing basalt wall that rises to the ceiling. Crevices on the rock's surface are covered with ferns and mosses, presenting the appearance of a warm tropical oasis. 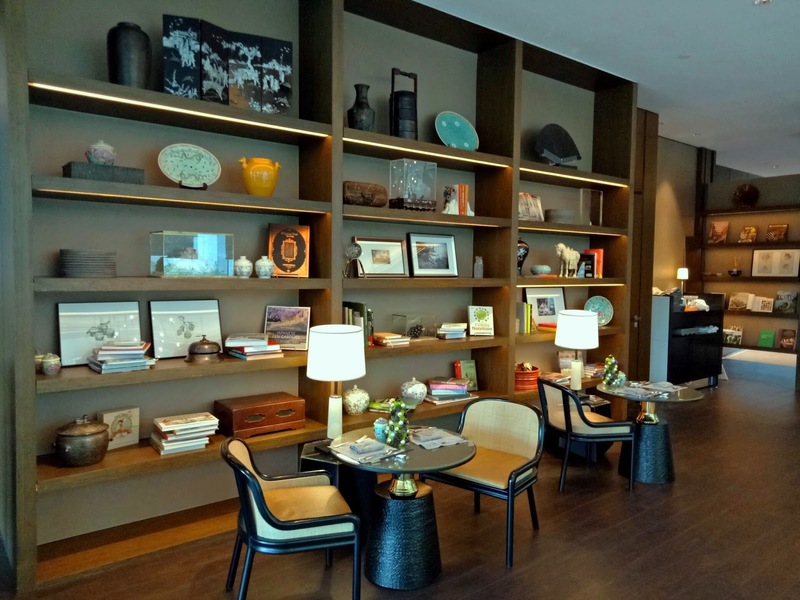 The Lobby Lounge provides a comfortable setting for casual family dining. Although there are proper dining tables, most guests prefer low coffee tables with comfortable café chairs. In addition, there are also cozy couches next to the glass walls. A small library at the back is stocked with reading materials for guests to pass the time. The food menu here leans towards local Singaporean heritage fare. 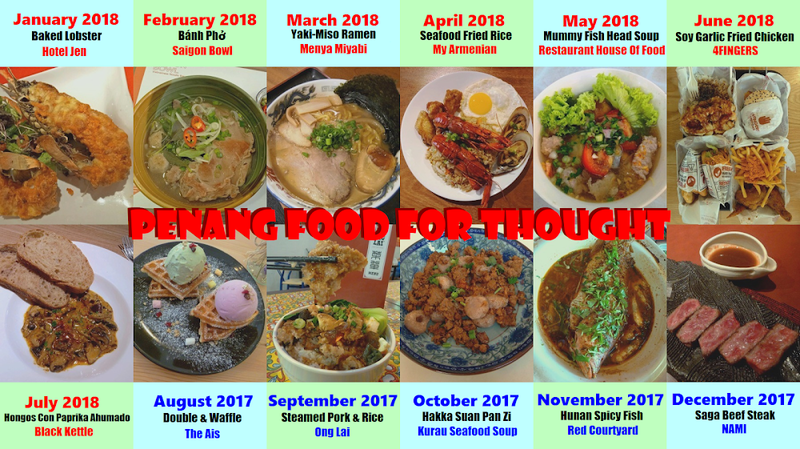 There are 6 signature dishes to choose from, each of which is inspired by a popular stall in Singapore's hawker scene. The Local Semi-Buffet Lunch is highly recommended. 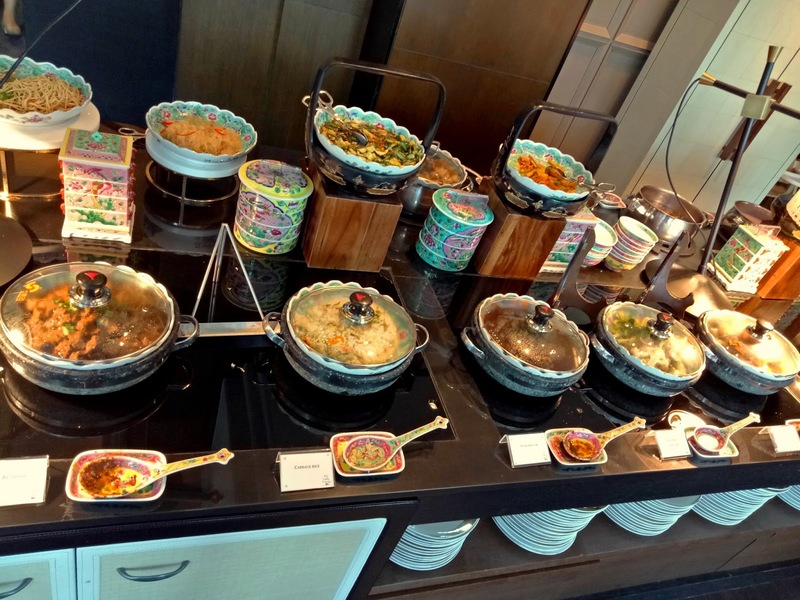 This offer allows the guest to pick a signature dish and drink, plus unlimited access to the buffet. For the signature dish, we were eyeing for the Chilli Crab & Mantou (辣椒螃蟹和馒头) but this delicacy is unfortunately not available today. Therefore, our first choice is Bak Chor Mee (肉脞面), a noodle dish of Teochew (潮州) origin. 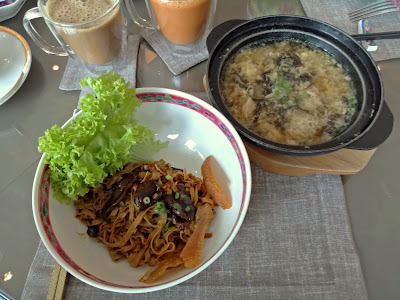 This dish is inspired by the recipe at Seng Kee Mushroom Minced Meat Noodle (胜记香菇肉脞面) at Serangoon Garden Market. 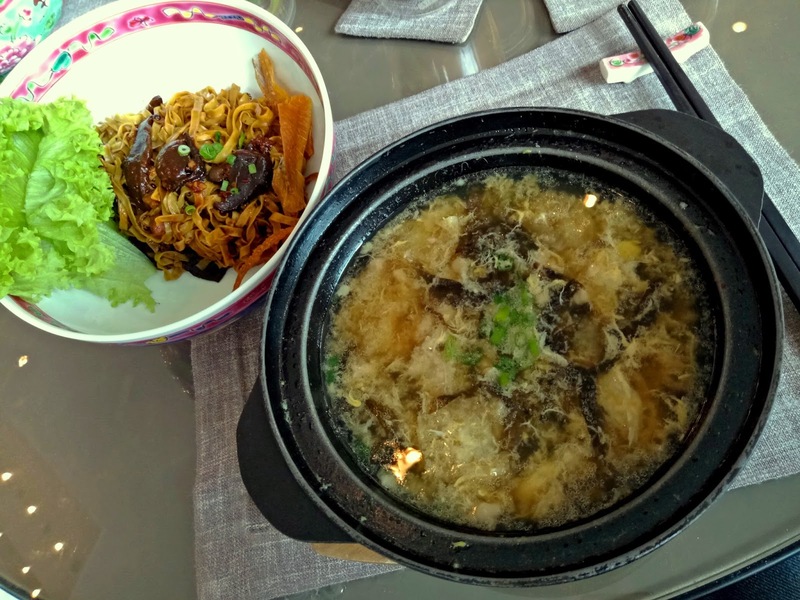 Bak Chor Mee is tossed in a dark sauce that is prepared from soy sauce, vinegar and pork lard. Minced pork, mushrooms and chopped scallion are added on top. However, it is the dried sole (鳎目鱼干) that does the heavy lifting to the overall taste. 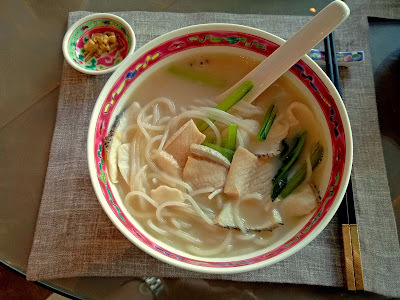 Served with Bak Chor Mee is a bowl of fish maw soup (鱼肚汤). 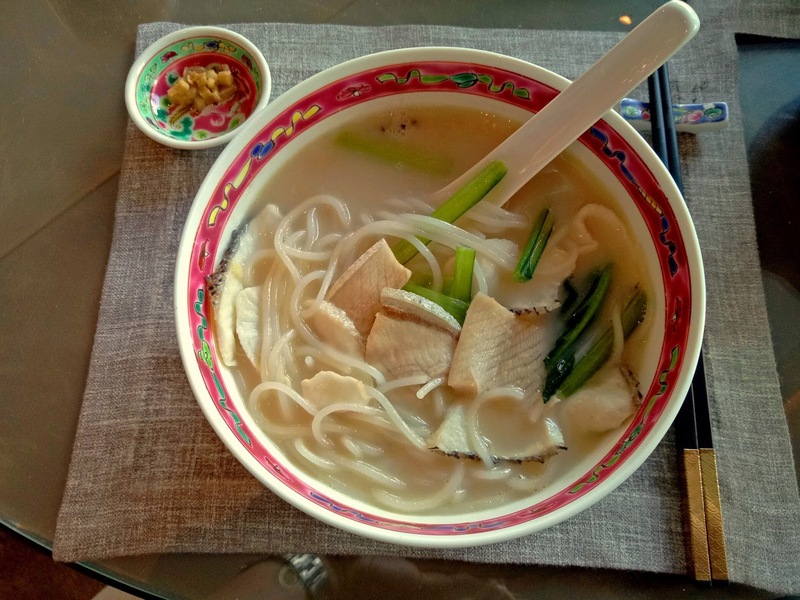 Stewed from pork bones, the soup is loaded with threadfin (马鲛鱼) fish maw, pork slices and eggs. The soup's taste is absolutely satisfying. Another popular dish from the menu is Fish Bee Hoon (鲜鱼米粉汤). This crowd favorite is based on the original recipe at Ka-Soh Restaurant (家嫂). Boiling hamachi (鰤鱼) bones for several hours culminated in a rich soup of creamy consistency. However unlike most recipes in Malaysia, no evaporated milk is used to prepare this soup. Thick rice noodle called "lai fun" (濑粉) is used here. 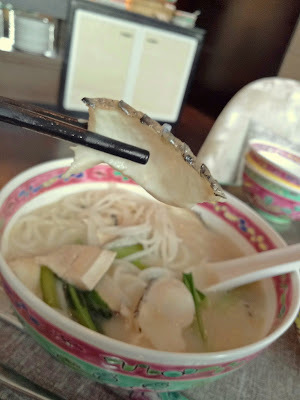 We also enjoy the delectable slices of giant snakehead (巨型鳢鱼). The fish is tender and succulent, making every bite gratifying indeed. Just before serving, a dash of XO brandy is added to suppress the strong fishy smell. 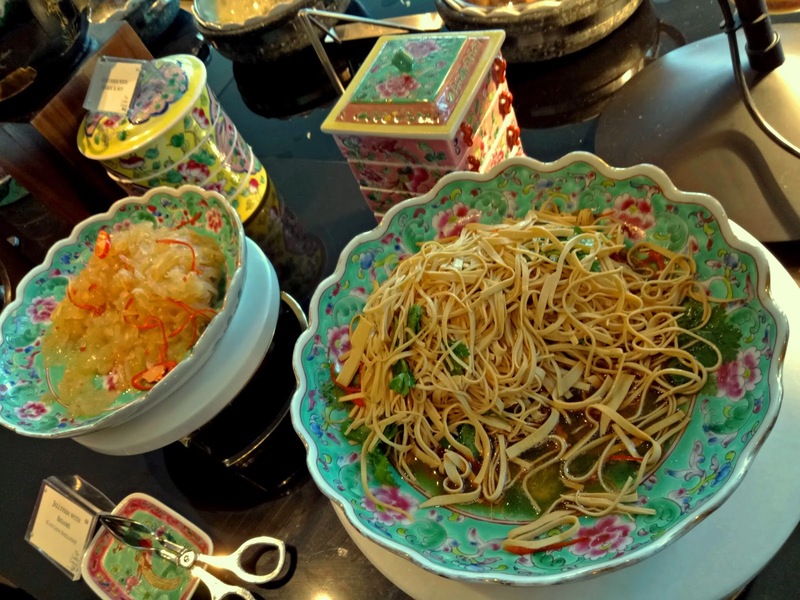 Meanwhile, the buffet counters present a variety of Peranakan dishes. Also known as Nyonya, the Peranakan culture is the legacy of early Chinese migrants who settled down in Penang, Malacca and Singapore several centuries ago. Back then, these territories were under direct British control and were collectively known as the Straits Settlements. 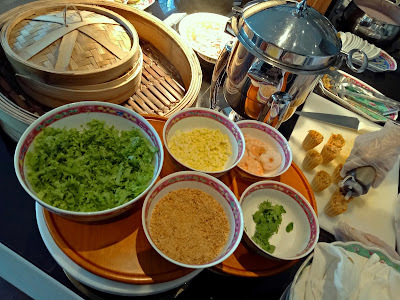 Starting with appetizers, Pie Tee consists of crispy tart shells filled with shredded carrots and jicama (凉薯). Cooked shrimps, omelette, dark sauce, chili sauce and coriander are also added to enhance its flavor. 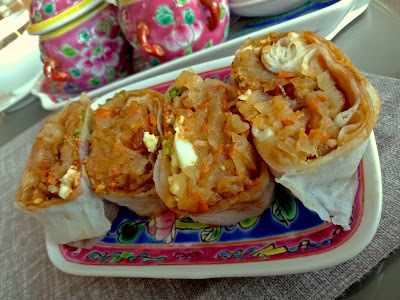 Popiah (薄饼) is a snack from Fujian (福建), a province in China from which the majority of ethnic Chinese in Singapore descended from. Wrapped in soft skin made from wheat flour, Popiah is typically filled with carrots, jicama, omelette, crushed peanuts, lettuce and fried shallots. Unlike Spring Roll, Popiah is never deep-fried. Achar is a pickled vegetable dish that consists of julienned cucumbers and carrots in sweet-sour-spicy dressing. Crushed peanuts and sesame seeds are sprinkled on top to improve the salad's mouthfeel. 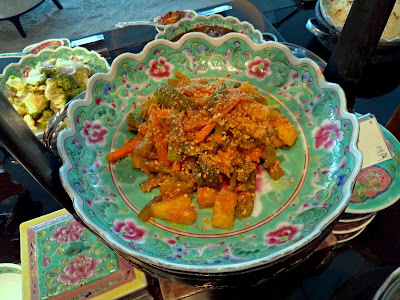 Like other Nyonya dishes, Achar is served using porcelain tableware reminiscent of the pre-modern days of China. 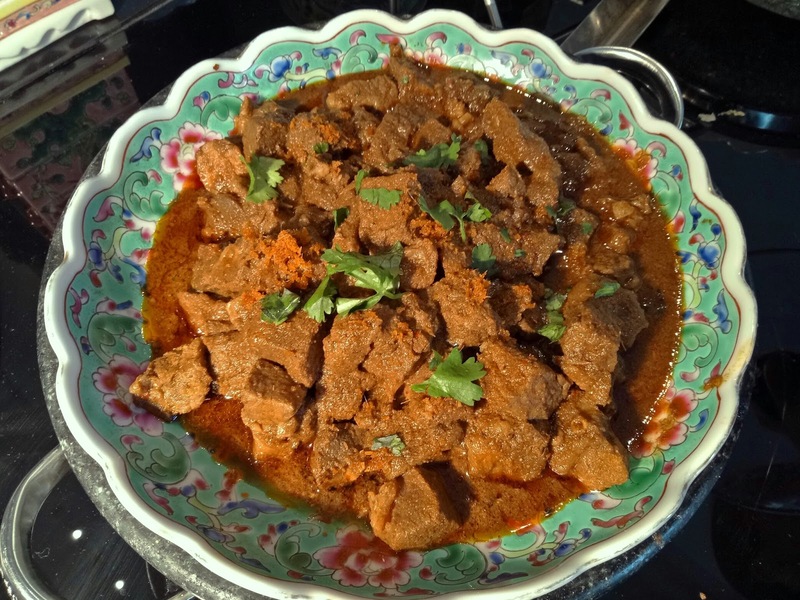 Beef Rendang is a traditional Minangkabau delicacy that is usually reserved for festive occasions and wedding ceremonies. The spicy dish contains bite-size chunks of beef seasoned with galangal, turmeric, lemongrass and other spices. Beef is slow-braised for hours until most liquid has boiled away, resulting in a savory dish saturated with essences of coconut milk and spices. 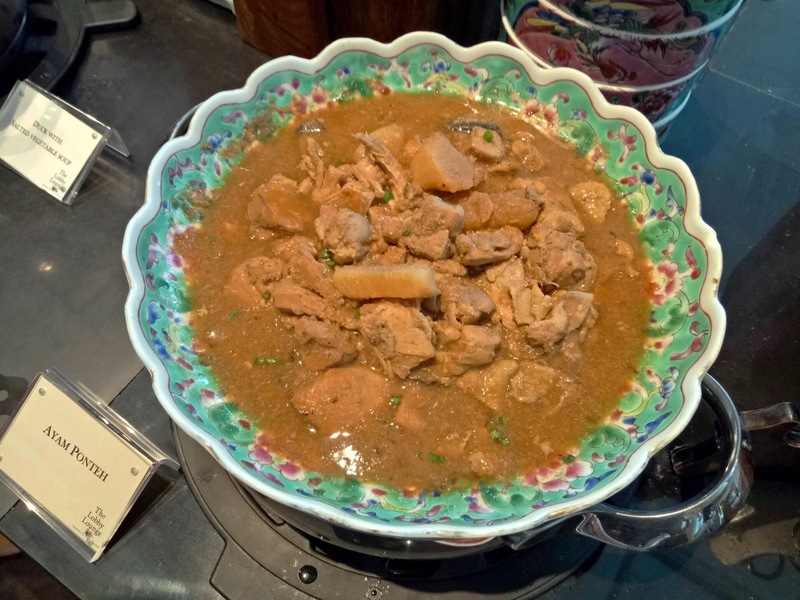 Ayam Ponteh is a popular Nyonya dish which contains chunks of chicken and potato. The thick gravy is made from fermented soybean paste (豆酱) and gula melaka (palm sugar). Another poultry dish which deserves special mention is Duck With Salted Vegetable Soup. Jellyfish With Sesame has similar taste and texture to its Japanese counterpart, chuka kurage (中華クラゲ). Meanwhile for Tofu Skin, yuba sheets are cut into long, thin strips that resemble noodles. 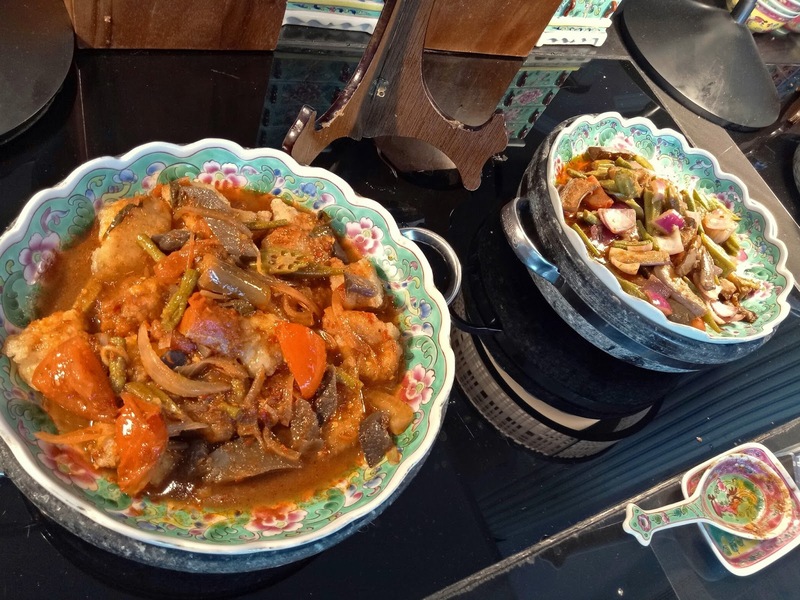 Next, Nyonya Assam Pedas Fish is cooked in spicy gravy. The gravy's fiery aroma comes from red chili peppers, while tamarind pulp is responsible for providing sourness. Cooked with battered fish fillets are assorted vegetables such as okra (lady's fingers), eggplant (brinjal), yardlong beans, shallots and tomato. Sambal Vegetables is the vegetarian equivalent of this dish. The desserts section presents a number of traditional Nyonya kuih. 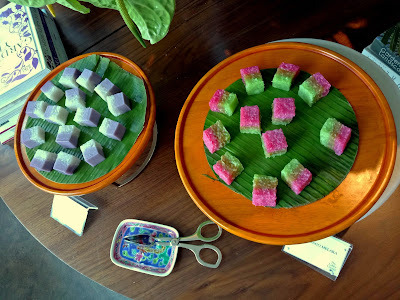 These traditional snacks are supplied by HarriAnns, a local family business which specializes in Peranakan recipes. Kueh Sago Melaka is made from sago pearls and gula melaka, while Kueh Lavender is infused with genuine lavender extract. 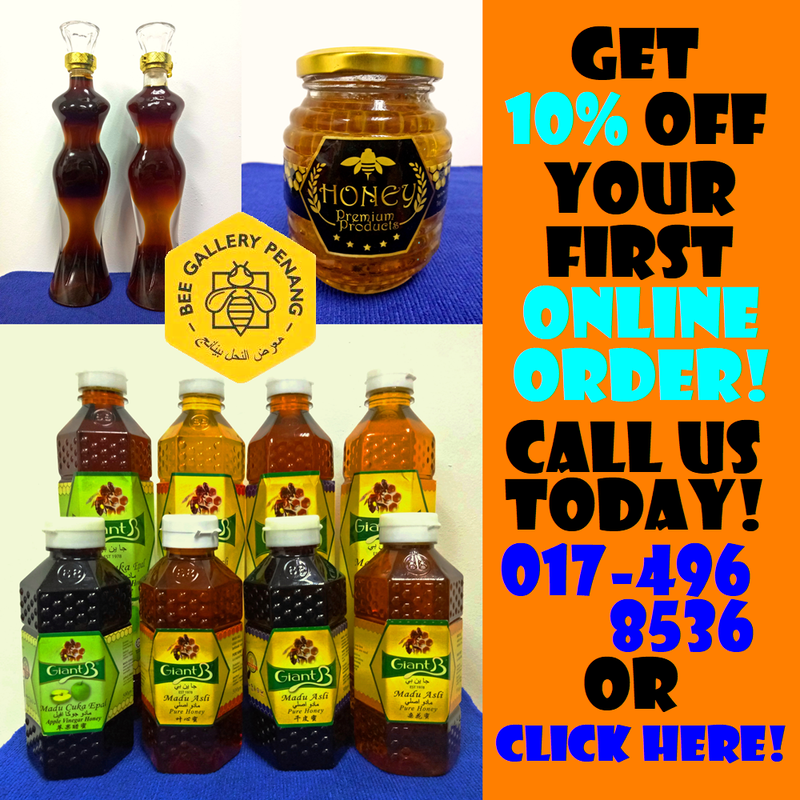 Other delectable choices are Ondeh Ondeh, Peanut Ang Ku Kueh, Kueh Salat, Kueh Lapis and Kueh Rainbow Lapis. Cheng Teng (清汤) is a sweet syrup with scrumptious ingredients like white fungus (银耳) and longan (龙眼). The dessert is usually served warm. Meanwhile, Bubur Cha-Cha derives its creaminess from coconut milk. 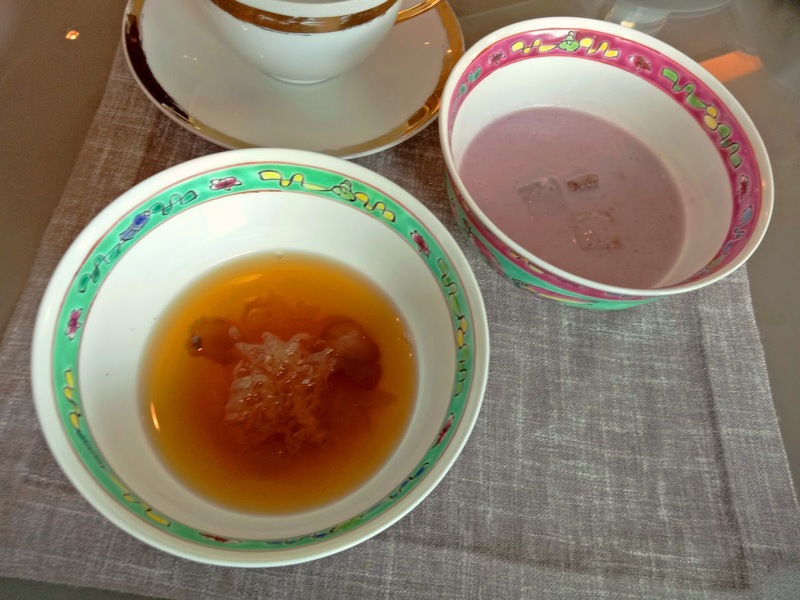 The warm, starchy soup also contains sweet potatoes, taro, black-eyed peas and sago pearls. 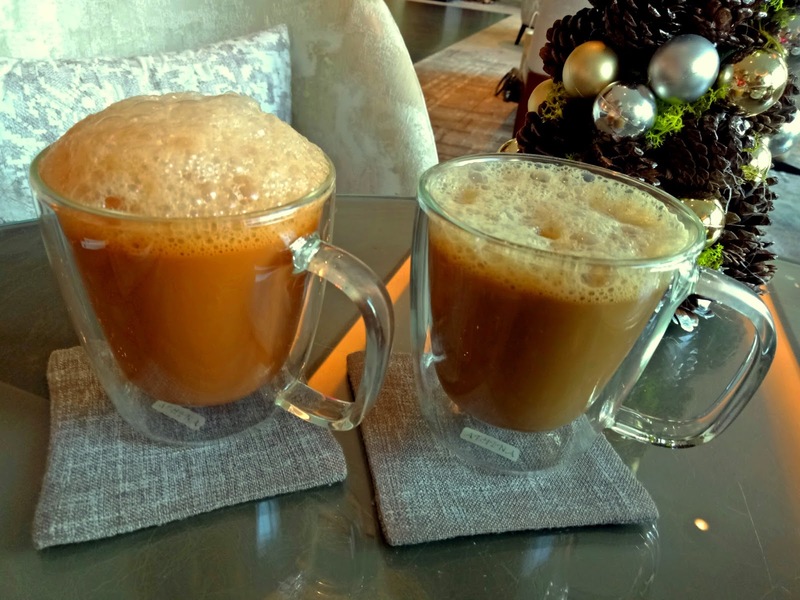 As for drinks, guests may opt for endless flow of Teh Tarik and Kopi C. Each drink is prepared by repeatedly "pulling" it between two cups. This process allows the drink to cool down and gives it a frothy top. Other drinks of the menu are Barley, Bandung, Chin Chow, Milo Dinosaur and Milo Over-The-Top. The Local Semi-Buffet Lunch is available from 11:30am to 2:30pm on weekdays (SGD42.00), and from 11:30am to 4:00pm on weekends and public holidays (SGD48.00). As for entertainment, live music is performed here every evening except on Sundays. The current star is the lovely Tria Bascon, who will be delighting the audience with classic jazz songs until 12 May 2018. Directions: Shangri-La Hotel Singapore is located along Orange Grove Road. The Lobby Lounge is located at the lobby of the Tower Wing. Shangri-La Hotel provides complimentary parking for its guests.